Our Amla tree has turned five. For the last two years, it has been bearing fruit. First time there were only a few amlas in its dainty branches. Second year the number was greater. Both the times it was a pleasure to see the translucent green amlas hanging from the branches. This year, it has been a bumper crop. Every inch of the branch is studded with fruits like pearls in a necklace. No pleasure is greater than watching your plants grow. It is a spiritually uplifting experience! 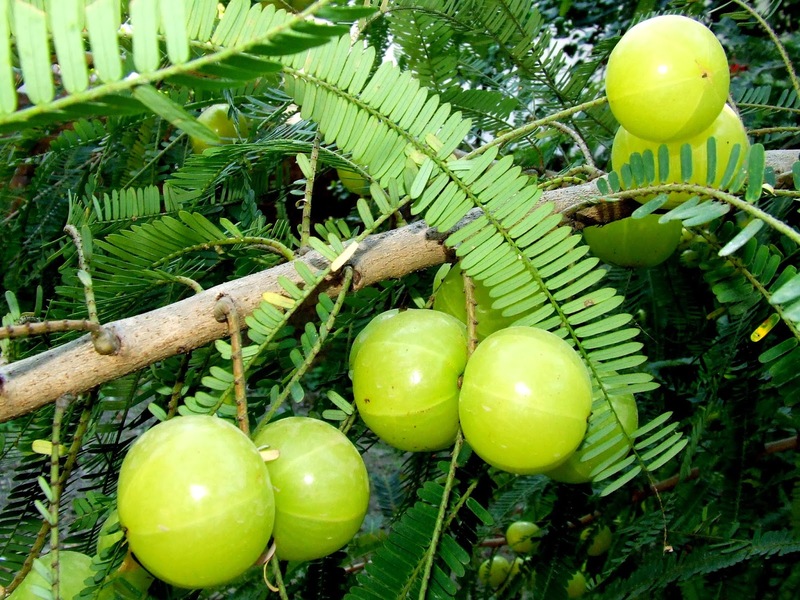 Amla or the Indian Gooseberry has immense health benefits. It is known as Amalaki in Sanskrit. The fruit is a natural anti oxidant and the richest source of vitamin C. Amla also contains chromium, zinc, calcium and copper. Amalaki finds mention in our ancient texts as a fruit that rejuvenates all the systems of the body, promotes longevity, youthfulness and general well being. It has immunity boosting properties. According to Ayurveda, Amla balances all the three doshas – vata, kapha and pitta of the body. Wash amla. Take water in a steel container. Water should be enough to cover the fruits. Bring the water to boil. Now add amla (add amla only when the water starts boiling). Let it stay in boiling water for 5 minutes. Turn off the heat and let the fruits sit in hot water for another 5 minutes. Discard water. Let the fruits cool down. With a sharp knife, trace the furrows in the fruit. Apply little pressure and separate the slices from the stone. Discard stones. Make sure the amla slices are of even size. Transfer the slices to a steel or ceramic container. Add sugar. Place a lid to cover the container. Cover and keep it for 3 days. Check next day. Amla slices will leave water. Stir with a dry spoon. 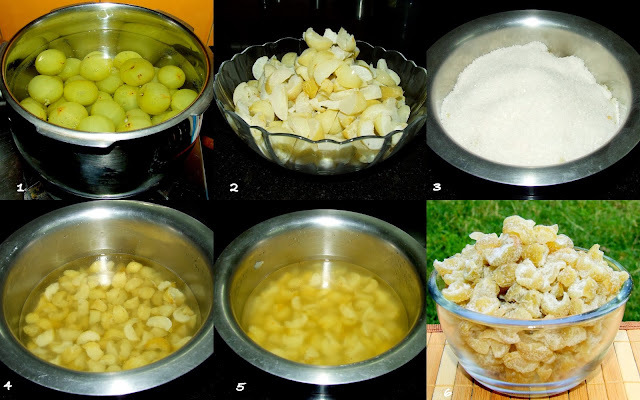 First the amla slices will float in the syrup then by third day, the pieces will sink to the bottom of the container. Use a colander to separate the slices from the syrup. Spread the slices on a steel plate and dry them in the Sun for two days. The pieces should be a little hard and dry on the surface but tender from inside. Roll the dried slices in half cup powdered sugar. Store in a dry and airtight container. Amla nectar makes a healthy drink. After removing the slices from the syrup, pass the syrup through a strainer. Transfer it to a steel wok. Bring it to a rolling boil. Lower the flame and let it boil till the colour changes to golden and it attains honey like consistency. Let it cool. Fill it in sterilized bottle. To sterilize the bottle, Place the washed and dried bottle with the lid in the oven. Set the temperature to 100 degrees and set the timer to 10 minutes. Remove the bottle and their lid from the oven and let the bottle cool. Pour amla nectar into bottles and secure the lid tightly. Add a tablespoon of amla nectar to a glass of lukewarm water and have it in the morning (adjust the quantity of nectar according to taste). It can also be had with cold water during summers. It is a tasty health drink. Lovely recipes! I love it that you have made the nectar at the same time. I just wish I could get fresh amlaki here- all I have found is the pickle. Well made, wish to have some, love gooseberries. Your homegrown Amla's look so beautiful. Love the Amla candy and the nectar. This is a very useful post. 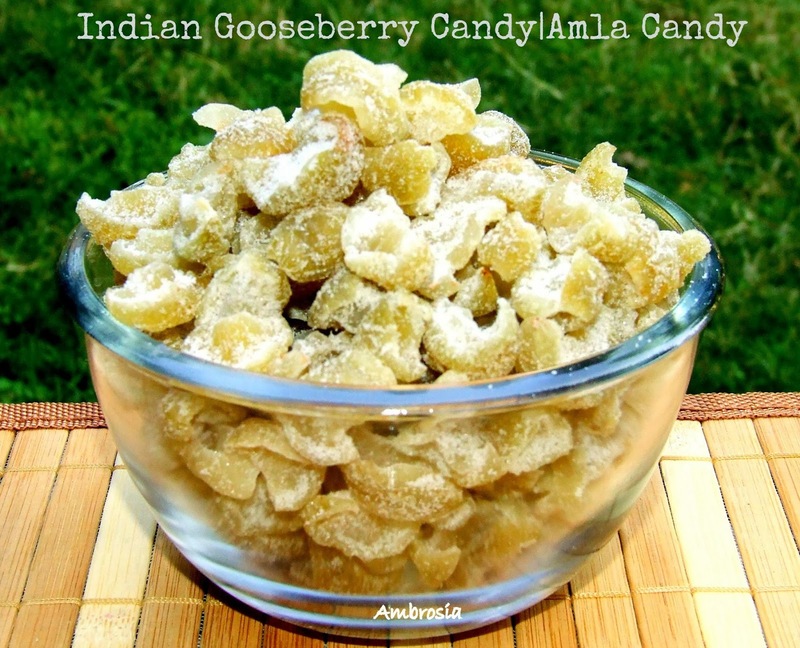 I love gooseberry candy. Usually buy it from market but this looks very interesting. I am so happy to read this receipe.. Amla is abundantly available in Mumbai in winter and am surely going to try this as amla candy is my kids fav candy..Not only it has good Vit C but also good for immunity.. Loved your beautiful cover page with Nature pics..
Lovely recipe and wonderful clicks ! Happy to follow you an chopping for same ..
Hi, Namita wonder reipes about Amla got to know many things after reading your post. Thank you for sharing.